In a nutshell, the 360-degree view is the foundation that makes an organization's relationship with customers experiential rather than transactional—the key to long-standing customer relationships and positive endorsements. However, achieving a 360-degree view requires all hands on deck. Organizations first must commit to developing customer-facing teams and start tracking structured and unstructured data. Then everyone from marketing to sales to customer service has a stake in capturing, analyzing, and responding to the data. By analyzing and understanding these facets of customers, a company are able to provide a more customized experience. Creating lasting relationships with clients is crucial to any business. The use of an intelligent and robust Customer Relationship Management (CRM) systems, means different departments can record and share correct, meaningful data or information about a customer, regardless of the medium used. This seamless sharing of data demonstrates professionalism and ensure that all interactions with a consumer leave little room for errors. It also means that each department are aligned with internal and external goals. What do the patterns about your customers tell you about their likelihood to purchase something? Do they demonstrate increased dissatisfaction at any point in the buying journey that may cause them to churn? What are the reasons for cart abandonment? A 360-view captures each customer’s interaction history and maps out an outcome for each event. The more comprehensive a data collection process is the more fine-tuned persona planning will be. Behavioral information, in addition to demographic knowledge, is vital for discovering broad trends and user response. So think about what data should be used to provide insights into customers. Look beyond analytics to include anecdotal data or feedback from customer service representatives with continuous contact with customers. Additionally, a customer is 4 times more likely to buy from a competitor if the problem is service-related, versus price or product-related. Marketing campaigns that fall flat are expensive. The more intelligent and data-driven campaigns are, the more successful they will be. Develop your organization’s customer outreach and upsell opportunities that are targeted to avoid spending money on a campaign that doesn’t perform. Additionally, with improved visibility into your customers, you can begin to segment them. After all, it doesn't make sense to invest the same amount of money in customers that make return purchases versus those who have never made one. A 360-degree view of your customers gives you the opportunity to deal with low-value customers differently. How can you achieve a 360-degree view? Customers are far better defined by their behaviors than their demographics. So, how you combine customer data for a comprehensive look? One of the best way to examine customer behavior is through social media. Social data is unfiltered and gives a glimpse into sociological attributes for your customers. It means your company can understand customer’s sentiments and how they change with the shifting trends of the world. Mension - A combination of social monitoring, analytics and competitor data, Mention allows brands to monitor their mention anywhere online. Hootsuite - This platform allows an organization to monitor any mentions on social media in real time. This allows an immediate response while the tool displays all the networks in one place making tracking and responding simple. Keyhole - By tracking industry-specific keywords, Keyhole enables a brand to keep an eye on specific keywords or hashtags they may already be or aim to be an influencer on. In addition, consumer traits like browsing and shopping patterns in tandem with social media activity, can be added to a CRM and used for more detailed persona creation and customer segmentation. As a byproduct, this knowledge helps fine-tune or refresh products as they grow out of style. Every customer interaction should be tied to a business goal regardless of the outcome of the event. For instance, if a customer interacts with a call center and is dissatisfied, there is data to be collected for customer retention. At the same time, customers and prospects leave footprints each time they interact with a business. Whether it’s on a website, through an app or leaving comments on social media, marketers have the ability to mine their data and understand intent. After collecting a significant enough amount data, it’s easy to analyze the results for the customer. Are they likely to buy and less likely to use customer service? What is the best way to market to them based on interaction? Are they prone to upsells or are they more likely to need heightened support? Additionally, marketing, customer success, and sales departments aren’t always as aligned as they should be. If your businesses launch a white paper with pertinent research, ensure sellers or customer service use it to reach out and proactively give advice or provide solutions. Without high-quality data, insights will be neither accurate or relevant. Keeping data organized and clean is the first step to being able to deliver on it. To achieve this, implement a process that encourages all departments to enter data into a consistent format. While time-consuming, it’s crucial to go back to the originating systems and organize historic data when possible. By creating consistency around how data is entered and managed, it will be easier to communicate cross-departmentally. In order to properly segment your customers, you need a process for categorization. When sharing data, it’s easy to lose reference of what the data is showing. Remember to use categories that ensure the relationships to other objects are intact. The data won’t make sense if you aren’t able to properly segment your customer silos and will hinder you from making salient observations about your customers. In such a customer-centric world with data becoming more valuable due to the insights it provides knowing the finer details of your customer base will make the difference when it comes to driving a purchase or entering into a partnership. Examine where you are in relation to customer knowledge and experience and grow from there. The key is to start small by identifying use cases and building on them as your data and analytical ability also evolves. 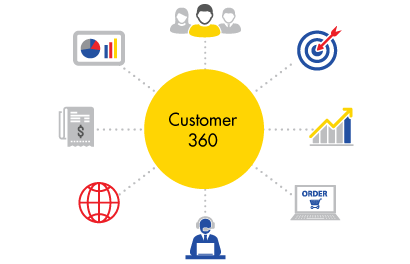 Ultimately a successful 360-degree customer view is one that is built over time, based on data and fed into across departments to provide a holistic view of your customers.